REACH [Registration, Evaluation, Authorization and Restriction of Chemicals] is the most publicized piece of legislation for substance compliance. It is described as one of the European Union’s major regulations in the last 20 years. REACH was adopted in 2007 to improve the protection of human health and the environment from the risks posed by hazardous chemicals, while enhancing the competitiveness of the EU chemicals industry. It also encourages alternative testing methods in order to reduce the number of tests on animals. 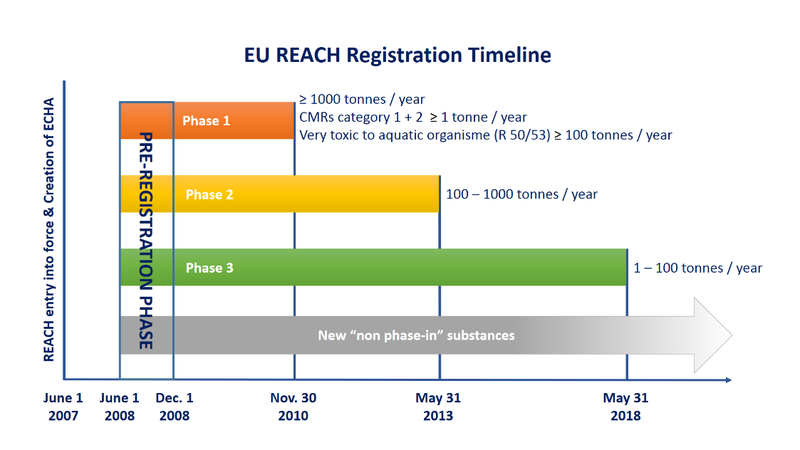 The EU REACH initiative is a long-term roadmap taking place over the course of a decade incorporating different registration thresholds for substance registration which will culminate in 2018 with the registration of chemicals used in excess of 1 metric tonne per year. The main challenge of REACH lies in the significant increase of workload generated by the requirements of the 2018 phase. Indeed, the scope of REACH 2018 is much larger than the two previous phases combined (2010 and 2013). ECHA expects that up to 70,000 dossiers will be prepared, covering 25,000 substances. In addition, the proportion of small and medium-sized enterprises (SME) affected by the 2018 deadline is much higher and many of these SMEs have little to no experience handling complex compliance regulations such as REACH. Do you make chemicals with the purpose of using them yourself or to supply to other people (even if it is for export)? Then, your responsibility is to provide information concerning the properties, hazards and possible risks of the substances you produce and to advise your customers on how to use your chemicals safely. You are not a manufacturer under REACH if you only blend substances into mixtures or use chemicals to produce articles. In that case you are a downstream user. Do you buy anything from outside the EU? If so, you are likely to have some responsibilities under REACH. It may regard individual chemicals, mixtures for onwards sale or even finished products, like clothes, furniture or plastic goods. Your responsibility is to make sure that the chemicals and products you bring into the EEA comply with these requirements. bring it into the EEA territory. If your non-EEA supplier has appointed an EEA-based “Only Representative” to register the substance, you are regarded as a downstream user under REACH. Companies based outside the EEA can appoint a European-based only representative to take over the tasks and responsibilities of importers for complying with REACH. This can simplify access to the EEA market for their products, secure the supply and reduce the responsibilities for importers. The non-EEA company is then regarded as downstream users for REACH. You may not realize it but your company might be using chemicals. Most industries and even the smallest companies use chemicals so check whether you handle any chemicals in your industrial or professional activity. If this is the case, you might have some responsibilities under REACH. You use chemicals in your industrial or professional activities. The supplier of a substance you use is established outside the EEA and has not designated an only representative. If this is the case, you are an importer. You only store chemicals and place them on the market (without changing their composition or packaging). Then, you are a distributor. What if you are established outside the European Economic Area? Companies established outside the EEA are not bound by the obligations of REACH, even when exporting products into the customs territory of the EEA. The responsibility for fulfilling the requirements of REACH lies with the importer established in the European Union, or with the only representative of a non-EU manufacturer established in the European Union. Visit our library for more resources concerning REACH 2018.